At Kraft Enterprise Systems (KES), we can provide a variety of consultation services to help you grow your business through ERP platforms. We are business partners with our clients. We've been helping our clients plan, procure, design and implement great business management solutions for over 20 years. We love to learn about business challenges and help create solutions that are impactful to the organization. Learn more about our firm. We can review your current use of the product and interview key users to identify if the software is meeting your needs. We will prepare a written recommendation that might include additional training, configuration and/or system enhancements. We can provide product support services on a monthly retainer or an as needed basis. We tailor our support services to meet your needs. We can teach your users how to make the most of your software investment and ensure proper usage. We tailor our training to each client’s business and provide training materials for future users. We can develop custom software product enhancements and integrations, such as our SuiteApps for NetSuite, so you can best capitalize on your investment. We will interview your key ERP employees to understand current processes and pain points. We will work with your team to prepare a requirments matrix, which can be used with external vendors during the RFP process. If you choose one of our platform products, we can assist you with the software implementation and configuration. With hundreds of ERP projects under our belt, we have the experience and knowledge needed for a smooth and successful implementation. If you are interested in evaluating one of our platform products, we can provide complimentary product demonstrations as well as information on pricing, configuration and system enhancement options. We apply a proven project management methodology to ensure we achieve stated results on schedule and within budget. Our services include preparation and ongoing maintenance of project plan, status reporting, coordination of status meetings, budget-vs.-actual reporting and cut-over planning. Thoughout the project, we will work jointly with your team to avoid obstacles, indentify and schedule tasks and execute, manage and monitor implementations. 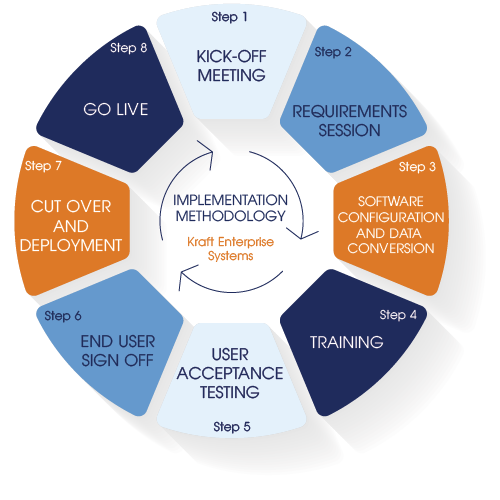 Kraft Enterprise Systems implementation methodology follows the waterfall project management philosophy. The waterfall methodology follows a sequential design process which ensures that requirements are properly scoped and documented before implementation.